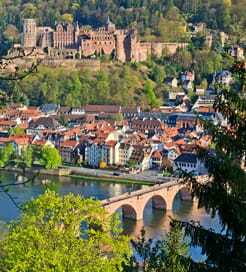 Being the largest country in Central Europe, Germany offers even a casual visitor a wealth of sights and sounds from hyper modern and fashionable cities to the sublime southern regions that border the Alps. Beautiful, vibrant cities display some of the very best of what the country has to offer, while in the quieter corners of the country, the landscape is filled with significant UNESCO World Heritage sites and unspoiled treasures. With its prime position in the Baltic Sea, Germany is the perfect gateway to mainland Europe with ferries arriving from Scandinavia, Eastern Europe, and Russia. The ports of Kiel, Rostock and Travemunde are the more popular destinations and can be reached from Sweden, Denmark, Finland, Lithuania, Latvia and Norway. The port of Sassnitz is another option for those coming from Sweden and also provides a link from the island of Bornholm while Lubeck is destination for ferries departing on the long trip from Russia. The shortest and most frequently operated route to Germany is the 19 kilometre ferry link between Rødby (Lolland,Denmark) and Puttgarden, a village on the island of Fehmarn. The trip takes around 45 minutes and there are up to 2 sailing an hour. Poland is also a good alternative entry point for those travelling to Germany. Though some of the of the departure ports are the same as those used for the crossings to Germany, the schedule and duration at sea may be a better fit for your plans. If you're travelling from the UK to Germany, as the direct link from Harwich to Cuxhaven ceased many years ago, you'll need to travel via France, Belgium or Holland and drive across. Whether the country is your final destination or you’re just passing through, all of Germany's major towns and cities are well connected by major infrastructure, and offer many options for onward travel. The German motorway network covers some 12,000 Kilometres ranking it among the most dense and longest motorway systems in the world. For those that aren't travelling by vehicle, the German railway network is modern, comprehensive and very efficient, not just domestically but also for onward travel to countries all over Europe. For more information, please visit our Ferries from Denmark to Germany page. For more information, please visit our Ferries from Finland to Germany page. For more information, please visit our Ferries from Lithuania to Germany page. For more information, please visit our Ferries from Latvia to Germany page. For more information, please visit our Ferries from Norway to Germany page.